$2 - your thanks for supporting us. $4 - Twitter shout out and special badge on the community site. $16 - MonoGame swag twice a year (stickers, tshirts, mugs, etc). As you can see i'm doing some sort of joke on power of 2 numbers there which might be bad if our tiers are too high/low. @MrValentine you can see the # of patreons there, currently 640. Note that Godot doesn't have much of a history of shipped games like MonoGame does. Re Godot, entry level is $5. Higher levels offer voting on tutorials, features, live Q&A, etc. From the supporter/contributor perspective these look nice to me in that they are clear and meaningful. Note that they also have some big tiers for corporate sponsorship which ends up being 33% of their revenue. I haven't seen your video, but emphasizing MonoGame's proven track record with successful titles will help sell it. $5 always seemed like a high starting tier to me. That is why i choose $2 for the base. some big tiers for corporate sponsorship which ends up being 33% of their revenue. I don't think we can offer that sort of sponsorship as we don't have that huge of an audience IMO. The sponsorship we did think about was for features/fixes that MG needs and some game might need and is willing to fund us to do it. IMO 2$ for the base are just right. Why not add such sponsorship levels? Can't hurt and maybe there is another game-studio relying heavily on MG that doesn't want to get into active development and wishes to donate some money that way (although the 1.500 platinum tier is too high for my taste). I don't think Godot has a huge audience either. They are certainly no Unity nor Unreal. The Patreon tiers are about what other people are willing to send your way, and another project has already given us the data points. And you might score that corporate sponsorship from a biggie like Microsoft which can (and should) afford it. Or a game company that is heavily invested. Between the "$5 is high" and thumbs down on sponsorship, I feel like you're being too shy. MonoGame has great potential, in part because it taps into the .NET/Visual Studio ecosystem, and a great story: significant MG games have shipped on all major platforms. Be proud and provide the chance for people and companies to send cash your way. Throw an eight and a 42 in there too! So, I won't have any issues signing up and using the service, so long as they continue to use PayPal, but note that MG will only get 90% of what you pay. Patreon keeps 5% as a fee and diverts 5% [That's a bit high] for transaction costs. Can the Patreon page list the current supporters on a page? recognition like a leaderboard is something, that can be fun for some of us... would help motivate to support more... but frankly I want a way where MG gets more of my money, which is why I intend to donate directly and forgo the Patreon thing really... but again, that is optional, it is there eitherway, and frankly I... dang it I would lose out on the wallpaper, Patreon it is! $8/month tier please for TutPaper! Totally missed the matrix reference. Thx for pointing it out. Agree on the physical schwag requiring more time and stress. Digital-only will be easier. Also the physical stuff could be done in an online store. In other words, the T-shirts and mugs can be sold on the side, independent of Patreon. Let's do this and see how deep the rabbit hole goes. Agree on the physical schwag requiring more time and stress. Yeah i saw other Patreon's offering a tier with swag and was doing something similar. It is more work and cost as we have to produce the products, make sure they have good quality, buy them, and ship them. If we had just a few dozen people at that tier it could be manageable, but if we got 100s it could end up being weeks of work. For sure we will consider this and see if there is something different we could offer there. Perhaps 2x/4x might be better? 100% I will go for the Azure option, I am not going anywhere else. but I can see it might be tricky to set up, but do look into it, if it looks viable. I just thought I'd pipe in here and tell you my experiences with Patreon. I'm going to be brutally honest because that's how I roll and I think it'll be useful for everyone to understand how it works from the creators perspective. So, first up, I'm the creator of MonoGame.Extended. I work on it with every bit of spare time I get (hopefully without burning myself out). In reality this adds up to about 20 - 30 hours a week. At first the project was small and relatively easy to work on but as the library got bigger and way more popular than I ever expected this amount of hours isn't really enough to cover everything. Luckily, there's been a number of great contributors to the project that have fixed a lot of bugs and made a lot of improvements (thanks guys!). But.. this really is my "spare" time. I'm a pretty normal 37 year old software developer. I have a full-time day job and I have a family (3 kids and a wife) to support. Sometimes real life gets in the way. Sometimes I get sick. Sometimes I do burn out and need a break. So while I try my hardest to work on it each and every week there are a handful of weeks that don't work out that way. Roughly estimated, I've put maybe 4000 hours into the project since I started it in 2015. Almost all of this time has been unpaid (if you don't count the few bucks I've received through Patreon already). I've also had a handful of expenses in that time (software, hosting, etc) and these costs have come out of my own money. My point is, this really is just a hobby for me. 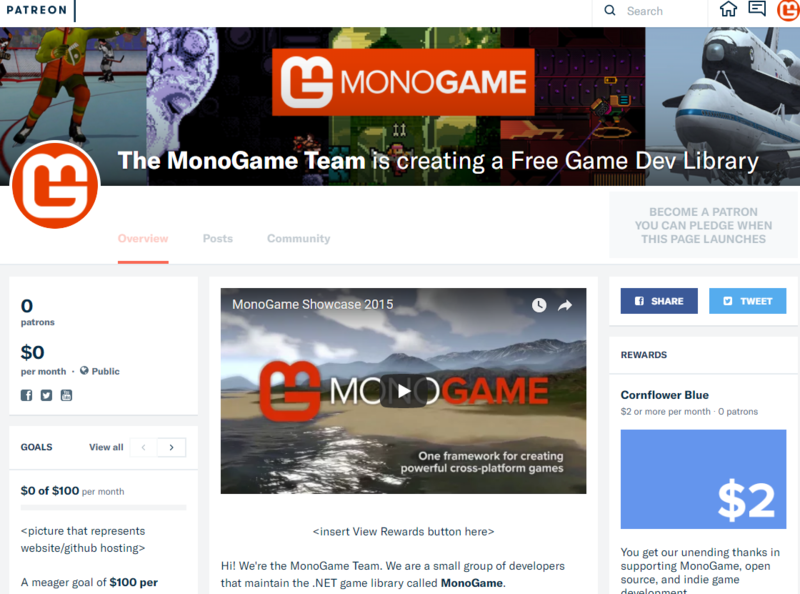 I started a Patreon page for MonoGame.Extended maybe 2 years ago. Honestly, I really had no clue how it would pan out. It was just an experiment to see what would happen. For quite some time I've struggled to understand how to make it work. I only have a few patrons but I really appreciate the support I get and I really want to deliver something valuable to them. Setting up the page is a little scary of course, because you don't know if you can actually create things the patrons will appreciate. I figured if I was honest with people and responded to any feedback I got as best I could it would work out okay. I've tried a bunch of different ideas for reward tiers. Some of them were a lot of work to deliver and as far as I can tell not really appreciated by all of the patrons. Most of the feedback I get from the patrons seems to be along the lines of "I support you because I like what you're doing". So it seems that the rewards are not actually the primary motivation for most people (as far as I can tell). I would love to find some reward tiers that works for both sides though. I don't really have a good way to keep the communication open with the patrons yet. I'd love to get to know them better to understand what they would like from me. This is probably my fault, but I'm always trying to think of ways I can improve it. This year I'm trying to put more effort into Patreon. I've been trying to post each week-ish with updates on what I've been working on. So far it's been positive in a limited sort of way. A couple of the patrons have commented on the posts and answered my questions. This kind of feedback is really helpful and hugely motivating. It's difficult to know how many people are actually paying attention. I really hope I can make Patreon work but the amount of money I'm making is not my primary concern right now. My main focus is figuring out how to spend my time on the right things. For me, Patreon is a tool to figure out how to help game developers with the libraries and tools that I make. I would love to find some reward tiers that works for both sides though. Thanks for the suggestion mate. Do you have an example of what one looks like? I've never heard the term and when I google it I get nothing useful. Seeing one would be great but I think I get the idea. I'll have a think about it and do some research myself on other Patreon's for similar things. I'm not entirely convinced a wallpaper is the best way to deliver a tutorial but I can see the appeal I'm willing to give it ago though. If you need help with intro video I would like to help somehow. Several Patreons I have seen provide the equivalent of the TutPaper through blog posts that are accessible to members only. They are probably a little more difficult to copy around being blog posts combining text and graphics whereas the TutPaper is just a single file. Although I have also seen Patreons for digital art that do the equivalent of the TutPaper. But the main reason I'm posting is to also push the idea of launching an imperfect Patreon. We don't need a great intro video or schwag in order to provide a normal outlet for repeating donations. Like a game, build something that works and then improve. I also still recommend using the same tiers as Godot since their approach is working and their domain is the same as ours. I agree with Iteration and Optimisation of the Patreon page... no need to nail it on the head, though on the flip side; I also agree.